Portuguese is the fourth language I’ve made an attempt to learn. Though you could argue my fluency in English is sound (I make my living as a writer using it, after all), after living with a Brit for several years I’m convinced we never gain complete mastery of our mother tongue. I took a semester of German early on in middle school, a nod to my heritage on my mother’s side, but it failed to engage me the way French did. French remains my strongest second language—its grammar I learned first, then a passion for its sounds keeps it fresh and golden in my mind. A couple of years of Spanish in college felt like a good idea, and it flowed easily for me: What you see in Spanish is what you say, every syllable. Before you think I’m a polyglot, let me be clear: speaking none of these languages is my forté. I can read passably well in French, and put a lot of meaning to Spanish on the page. But the words don’t make it from my brain to my mouth very easily in either tongue. 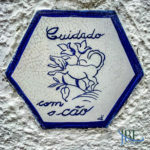 To add to my natural hesitation to speak, it took time (and living for three years in Portugal) to get over myself, to recognize that all around me folks made an effort to speak English, and I never faulted their pronunciation or missed words, but encouraged them to keep going. 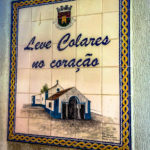 Why wouldn’t they feel the same way about my struggles—even when, over and over, the shishings and dropped ends of words in Portuguese confounded my decidedly non-Latinate tongue? So I practice every day, usually the most mundane transactions. Our local postmistress shows great patience with me as I’ve moved from barely managing “Bom dia” to now remarking on where and to whom my correspondence goes. I can order wine like a champ; only once in a while do I fail to make it clear what I want, and wind up with a tinto instead of a branco. My best Portuguese has been acquired by necessity. 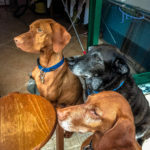 When you have dogs, you must learn how to manage them in the local language or risk a real falling-out with your neighbors. 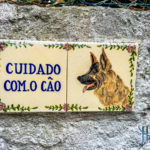 “Minhas cadelas e o meu cão” are here in Portugal. 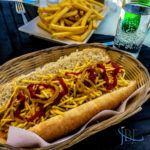 They would be “os três cachorros” in Brasil, but here that would order me three hot dogs. As we learn other tongues, the world opens up around us, and the fog of incomprehension lifts. 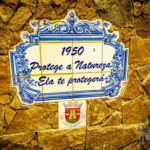 It will be a lifelong journey for me and my Portuguese, but a fun one. My tongue has already loosened and I can almost trill an “r”! 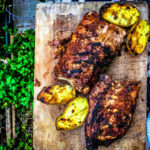 One dish that translates well across American and Portuguese cultures is a rack of ribs on the grill. 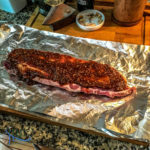 A slab of pork ribs coated with marinade and slow cooked in the oven before finding a sear on the grill makes for a fine dinner (enjoyed by man and canine alike). Stephen has crafted his own pan-Asian style marinade with Portuguese accents, and we like it year-round, though it takes on special flavor during the long evenings of summer. Preheat oven to 140 degrees C (280 degrees F). Place rack of ribs on a plate, and bring to room temperature. 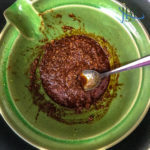 Make marinade: In a medium bowl, stir together all remaining ingredients to blend fully. Brush marinade on both sides of rib rack. 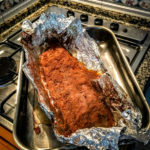 Place rib rack on broiler pan, and cover with aluminum foil to seal well. Place in the oven for about 2 hours. When the ribs have about 25 minutes left, prepare charcoal grill, or preheat gas grill per instructions for a medium hot fire. 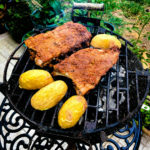 Place precooked ribs on grill, turning after 5-8 minutes, depending on the amount of crust you like. Longer means a more blackened sear! 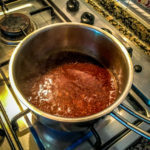 Heat the remaining marinade to a low boil to finish, and serve on the side as a sauce. Suggested accompaniment: grilled potatoes and a green salad.